We’re excited to announce that a digital tool for creating Atlas CareMaps is now ready for public use. You’ll find it at www.AtlasCareMap.org. Everything you can do with a hand-drawn Atlas CareMap, you can now do online, and much more. 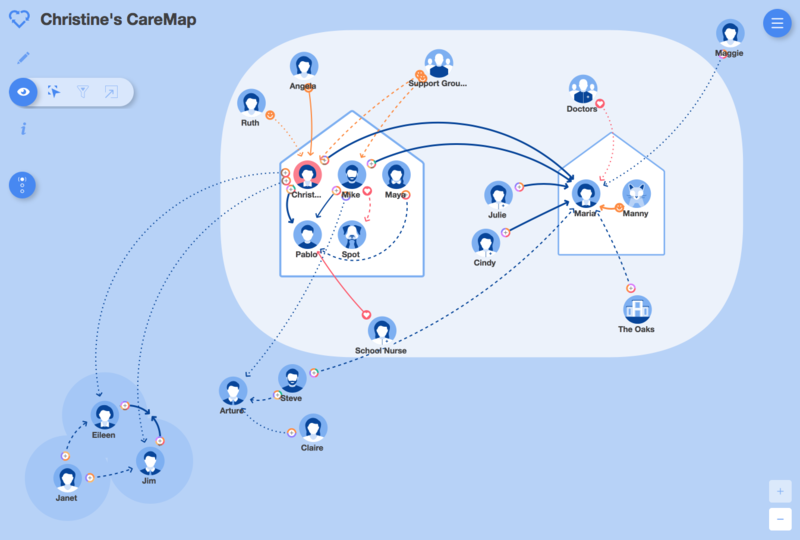 Clearly see your care ecosystem — With your personalized Atlas CareMap you can better manage the people involved, recognize support, plan for potential difficulties, advocate for your needs, and get appropriate assistance. Draw your own Atlas CareMap — Use simple gestures to draw the Actors (people, pets and places) involved, as well as their Links (who cares for whom, and how). Add details — Specify the types of and frequency of support provided. See changes over time — Save snapshots of your Atlas CareMap at different points in time. View your Atlas CareMap in different ways — Highlight different aspects of your care ecosystem. Add Potential Actors — What would your ecosystem be like if …? In your preferred language — Instructions are available in English and Spanish. You can enter your own information in whatever language you prefer. Print your Atlas CareMap — Get a pdf of your Atlas CareMap that you can print or email. The pdf includes your Atlas CareMap as well as details about all the Actors and Links. Support Family Care Research — Nonprofit Atlas of Caregiving studies and supports family care. Data from thousands of Atlas CareMaps enables new understanding of real-world care ecosystems. You will find guidance and tips throughout the software. When you create a new Atlas CareMap, a brief tutorial shows you the basics of drawing Actors and Links, followed by a guide that gets you started. After that always-available “tip cards” show you all the key functions. A computer or tablet (but not a smartphone) with an up-to-date OS and modern web browser (Chrome, Safari, Firefox, and Edge). Some functions may not work properly with older software. We are continuing to improve the software, by adding features and fixing problems. If you have comments or suggestions, please let us know.